In May of 2017, I wrote a post about a wonderful visit we had to Domaine les Pentes de Barène in Tursan, an tiny wine growing region in the SW of France. I mentioned that our host, Gaelle Vergnes, had given us two bottles from their first ever bottling of a sweet wine, which they make uniquely from the petit manseng grape. 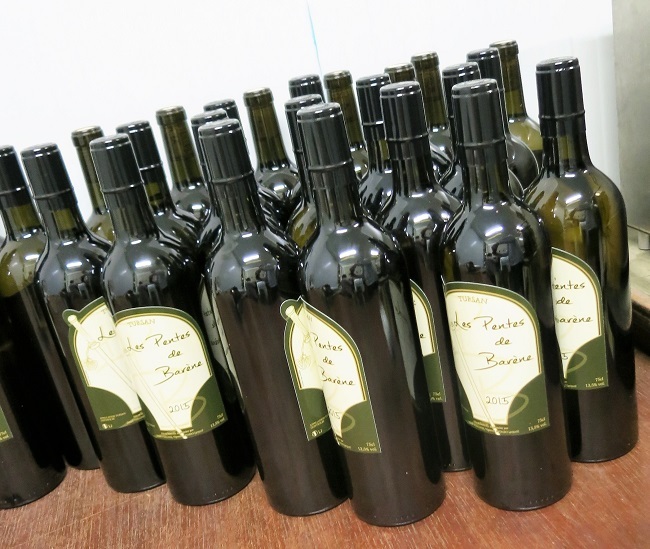 They call this wine “M de Pentes de Barène” and the entire 2016 production was only 250 bottles. Sweet wines from this region have the capability to age for a number of years, so, accordingly, one of those bottles is currently slumbering peacefully in a cool spot in our house in Orthez. The other made the trip back to Seattle with us. Madame Vergnes recommended that this wine not be tasted before August of 2017, so we obediently resisted the temptation to crack it open until this month. We had our first taste in the company of a platter of the Jambon de Bayonne, the iconic ham from the SW of France. Délicieux! 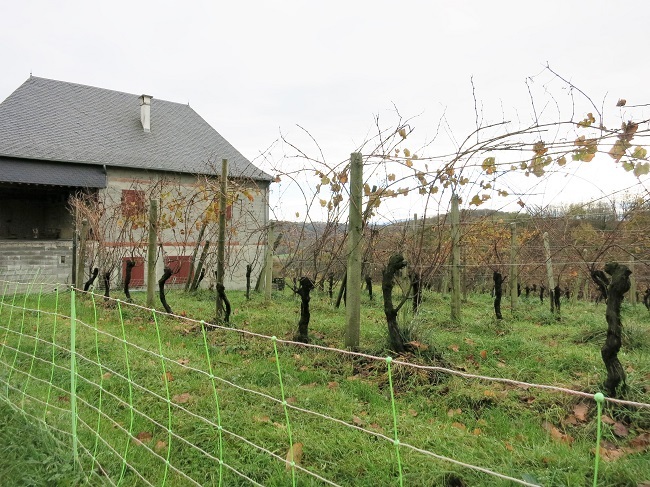 I took advantage of an old friendship to arrange a visit with a winemaker in the region of Jurançon, which is only 25 minutes or so from the house in Orthez. Our good friend Gerard Boisseau is a wine professional of impressive stature and a long-time agitator for biologique (organic ) and biodynamique wine making. 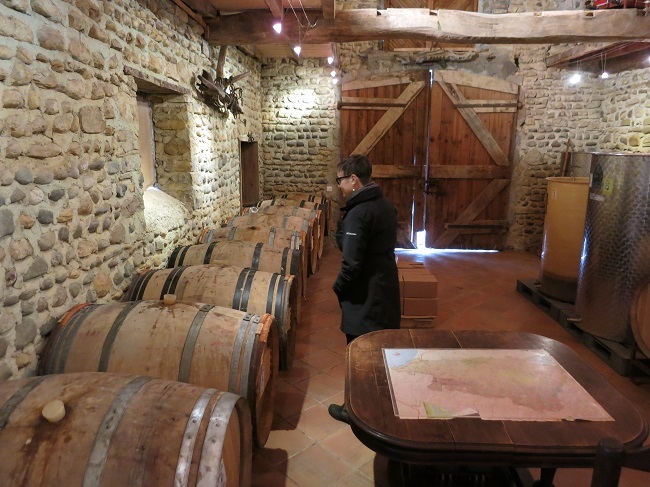 So it was no surprise that he recommended a visit to Chateau Lapuyade – Clos Marie Claire, where winemaker Jean-Joseph Aurisset produces certified biodynamic wines. Without belaboring the explanation, biodynamic farming is basically an extension organic farming’s prohibition on the use of chemicals and manufactured fertilizers. To this, the biodynamicist adds farm methods that spring from received peasant knowledge, including working in harmony with the cycles of the moon, the use of plant and mineral “teas” to support the growth of plants and fight maladies, allowing weeds to grown among the vines to encourage biodiversity and a balanced environment, in short viewing nature and all its elements as allies to work with instead of enemies to be battled against. 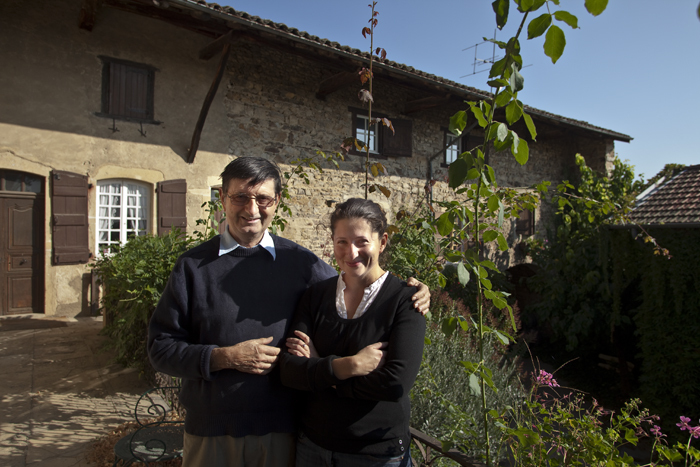 Jean-Joseph inherited his vineyards and his metier from his grandfather, and it was he who added the “Clos Marie-Louis” to the chateau name in honor of his grandmother. 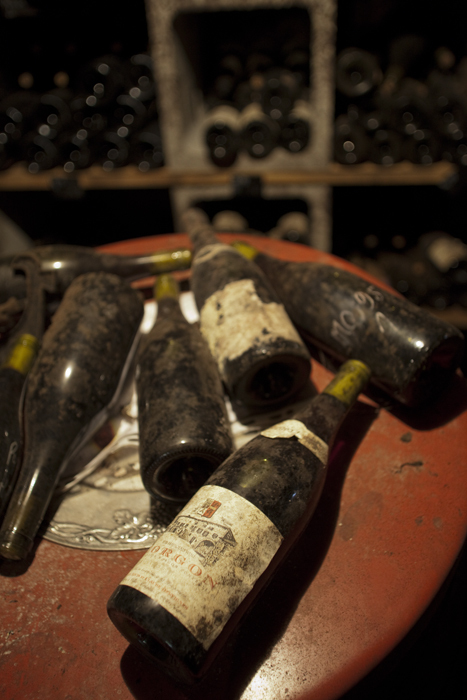 Today, his two daughters, aged 14 and 16, help in the vineyards and in the cave, even producing their own barrels of wine, but Jean-Joseph stresses that they haven’t yet made up their mind if wine making will be there future (although he makes no secret of his desire to one day pass the chateau on). Like many small wine domaines that follow biodynamic methods, Chateau Lapuyade is really a working farm. In addition to 8 hectares of vines, the property also includes forest land, pastures and fields of grains and hay for livestock. The family also make their own jambon de Bayonne, foie gras conserves and dried sausages and Jean-Joseph works part time in his farm-equipment business. 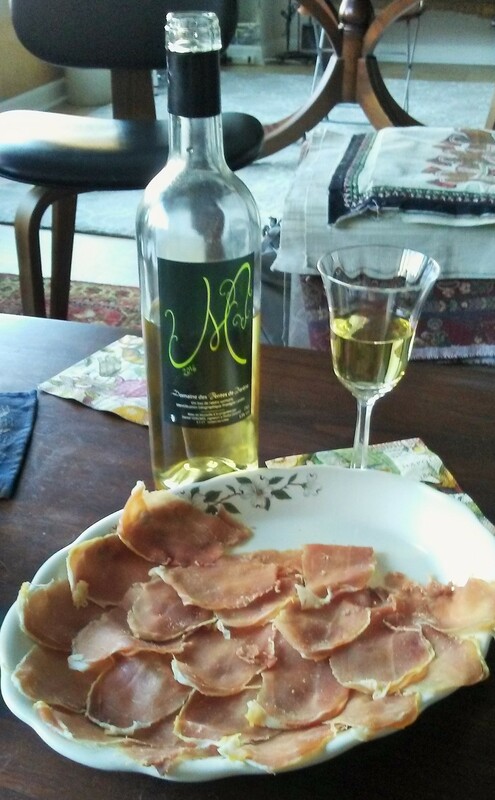 The farm runs on the work of the entire family, including Jean-Joseph’s mom, who graciously offered us a few plates of foie gras toasts, sliced sausage and ham to accompany our tasting. Even the in-laws lend a hand, being especially adept at the preparation of nettle teas that are a vital part of the biodynamic methods. The farmhouse and vineyards at Chateau Lapuyade. 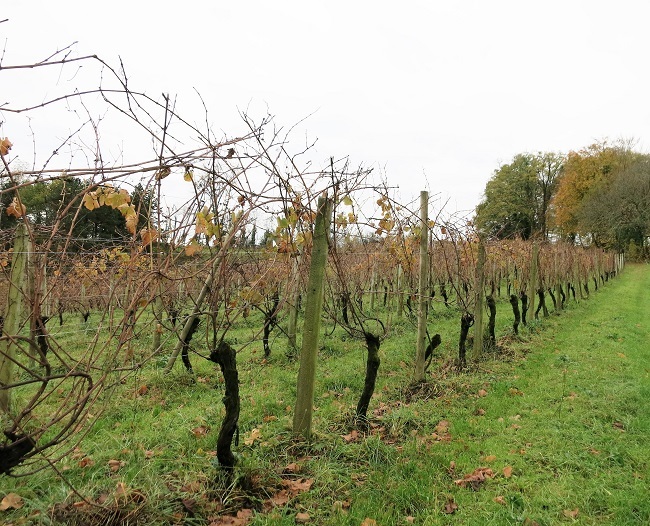 Notice that the vines are trimmed very high, to help them better negotiate the frost that comes with the Bearnaise winter. A field of gros manseng vines. 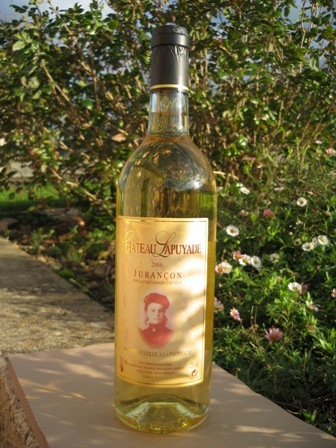 In Jurançon, the wines are traditionally whites, both dry and sweet, made from gros manseng and petit manseng grapes. Both of these at Chateau Lapuyade are excellent, especially the sweet Cuvee Marie-Louise, which is made from grapes left on the vines until well into December and aged in old oak barrels for 3-4 years before release (the chateau purchases used oak barrels from Chateau d’Yquem). Last year the chateau produced only 600 bottles of this cuvée. Tasting in the cave which formerly was the berger which housed livestock. Jean-Joseph also makes a not very common Jurançon rouge, from tannat and cabernet franc grapes, a wine he claims is just to amuse himself, and for home drinking. I found it a nicely balanced, medium body wine, ideal with the local specialty confit de porc, pork loin slow cooked in porc fat and served with roasted potatoes tossed with chopped parsley and garlic. *Spraying with teas made from ferns foraged on his property helps ward off mildew on leaves for grapes. *Before his conversion to biodynamic farming practices, Jean-Joseph decided when to harvest based on chemical analysis of the sugar content of his grapes. Now, as soon as he sees the birds begin to eat the grapes, he knows it is time to harvest. His biodynamic teas are all made with spring water from a natural source at 1500 meters altitude in the Pyrenees. *He never undertakes any activity involving nature, meaning just about everything on the farm, during a new moon. *Applications of fermented seaweed around the base of the vines activates their energy. Bob Peterson is a fantastic photographer, a great friend of Le Pichet and Cafe Presse and a personal friend of mine. He and his wife Lynn are also fellow francophiles who have traveled extensively in France for work and pleasure. 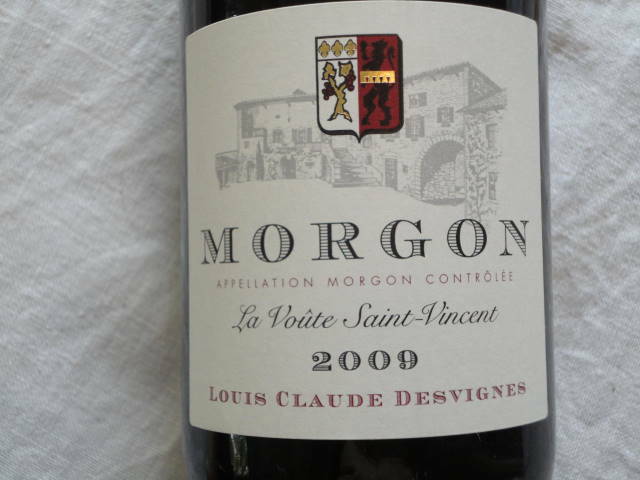 After reading the recent post about the Desvignes Morgon that we are serving at Le Pichet, he sent along these photos of his visit to the Desvignes home in 2009. Hope you will enjoy them. to take home with you. Special take-out wine prices apply to go bottle purchases, including 10% discount on orders of 6 or more bottles with pre-order. Please call Le Pichet for availability and special August pricing for this wine.